Prince George's County Fire/EMS Department Chief Marc S. Bashoor is seeking ideas and concepts to modify the PGFD logo as well as the striping and lettering for anticipated new apparatus, command and utility vehicles. "As we move towards ordering of new apparatus and a limited number of sedans/SUVs, I have authorized a change to red county apparatus, with white cabs/stripes. Additionally, most new sedans the county orders will be red and marked. As part of a limited re-branding of the Department, we have already taken the step of changing the logo wording to "Safety First, Everyone Goes Home", however I am now asking for ideas on new striping and lettering setups, to include the PGFD and physical scotch-lite arrangement. Please forward any concepts or ideas - hand drawn or computer generated - to Major Hess at Apparatus Maintenance, by December 23." The Laurel Volunteer Rescue Squad, at 14910 Bowie Road, Laurel Maryland 20707, would like to invite the press to the dedication of our new heavy rescue squad. The event will be held at our station on Saturday December 10, 2011. The event starts at 11:00 am. Our new heavy rescue squad is a 2011 Pierce Arrow Heavy Duty walk-in squad. This vehicle carries all of the latest fire and rescue equipment to better serve the citizens of Laurel and the surrounding area. We are proud to dedicate our new vehicle to one of our founding life members: Finley DoCarmo. Mr. DoCarmo has been a volunteer with the Laurel Volunteer Rescue Squad for 57 years. And is still an active participant in our operations. I would be happy to provide more information to interested press members. Please RSVP if you are interested in attending. 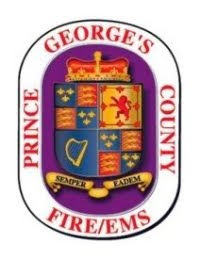 The Prince George's County Fire/EMS Department News Blog, http://www.pgfdnews.com/, has added a new informational web link that is a tremendous asset to the safety and well being of every member. The Department's Safety Officers have created a website that contains a wealth of information for every member. In addition to a calendar for safety officers, the safety website contains a list of approved PPE, Safety General Orders, forms, latest safety news, safety training and contact information for safety officers. This is excellent information that could be used for company drills or self-study and is currently available on the site. Visit the site often as information is updated on a regular basis. Remember, Safety First Ensures Everyone Goes Home. The link is located on the right hand side of the blog underneath the search box. It is with great sadness that the Officers and Members of the Prince George’s County Professional Fire Fighters and Paramedics Association announce the passing of Past President Robert J. Fuller. Brother Fuller served three separate terms as Union President and retired from the Fire Department at the rank of Captain. Brother Fuller presided over very tumultuous times in the infancy of the newly created combination fire service in Prince Georges County. Following the groundwork laid by his predecessors, Fuller established our organization as a leader in fire service labor relations at the local, national and international level. His legacy continues to serve his successors and benefit the modern day fire service and its members. Bob Fuller began his career with Prince George’s County Fire Department and worked at Stations 6, 7, 9, 22, 26, and 33. He also had assignments at the Bureau of Training to instruct Career Recruit Schools and Officer Candidate Schools and in the Bureau of Fire Investigations. Brother Fuller received several Letters of Commendation and other Recognitions of Distinguished Service. Most notably, he was awarded a Medal of Valor for the rescue of an entrapped occupant from a burning vehicle. He was off duty at the time. Fuller also received recognition for actions at an overturned gasoline tanker. After securing a protective hose line, he waded through gasoline to close the hatches on the top of the tanker, thus reducing the spill and overall danger. As Union President, Bob placed his career in jeopardy on several occasions. He constantly tested the will of politicians in his efforts to secure the best working conditions for his Union Brothers and Sisters. Bob was not afraid of any politician. Fuller was very adept at politics and worked hard to develop relationships with friendly politicos, and worked even harder to take down labor’s enemies. He began the practice of picketing County offices and work sites to bring our message to the public. Politicians soon realized that our Union was a strong and vocal political force. Fuller also presided over the signing of the first Collective Bargaining Agreement between IAFF Local 1619 and Prince Georges County. Furthermore, he led the initiative for the establishment of the ranks of Career Lieutenant and Career Battalion Captain, ranks which eventually evolved to Career Battalion Chief and Major. Prior to this time, Sergeant was the highest rank in the career service. Bob Fuller was a true leader for his time. While Local 1619 fought the battles that had to be fought, Bob Fuller always treated people with respect. When the Union didn’t even have an office, Bob Fuller was embraced by the volunteer membership at Station 22, and given a desk directly facing the desk of the volunteer chief, a situation that was unheard of at the time. From there he conducted the business of the Union until the Association was able to purchase its first Union House on Mitchellville Road. Furthermore, while assigned to Station 22, Bob was able to persuade the Fire Department management to experiment with having a career driver and officer on shift work. This ultimately led the way for fully staffed shifts, providing around the clock coverage to the County. After retirement, Brother Fuller continued a distinguished life in public service. He served as a Member of the Charles County Board of Education from 1982-90, a Member of the Charles County Board of Health from 1990-2006, various terms on the Charles County Board of Fire and Rescue, and most notably as a Member of the Charles County Board of County Commissioners from 1990-2006, where he served the last four years as its Vice President. The legacy that Bob Fuller leaves is one of honesty, integrity, hard work and common sense. The results are the working conditions, salaries and benefits that our members continue to enjoy. Bob set the bar for successive Union leaders to improve these benefits through each new collective bargaining agreement. Bob Fuller will always be remembered as a very fun loving enigmatic leader. He loved the fire service, and loved the idea of serving others. His contributions to the Prince George’s County Professional Fire Fighters and Paramedics Association, to the fire service, and to his community shall not be forgotten. Visiting hours will be from 2 to 4 PM, and 6 to 8 PM. A service will be held at 7 PM. The National Weather Service (NWS) has issued a FLOOD WATCH for Prince George's County. The warning goes into effect at 1:00 pm today and lasts through late tonight. A Flood Watch means there is a potential for flooding based on current forecasts. FAIRFAX AND PRINCE WILLIAM COUNTIES IN NORTHERN VIRGINIA. * FROM 1 PM EST THIS AFTERNOON THROUGH LATE TONIGHT. Instructions: A FLOOD WATCH MEANS THERE IS A POTENTIAL FOR FLOODING BASED ON CURRENT FORECASTS. MONITOR LATER FORECASTS AND BE ALERT FOR POSSIBLE FLOOD WARNINGS. THOSE LIVING IN AREAS PRONE TO FLOODING SHOULD BE PREPARED TO TAKE ACTION SHOULD FLOODING DEVELOP. Stay Informed, Stay Ready, Stay Safe. Flood Safety Tips... • Never try to walk, swim, or drive through swift-moving floodwater. If you must walk in a flooded area, walk where the water is not moving. Remember, 2 feet of water will float your vehicle and 6 inches of fast moving floodwater can knock you off your feet. • If you come upon floodwaters, STOP, TURN AROUND AND GO ANOTHER WAY!! • Do not attempt to drive through a flooded road. • If your car stalls, leave it and seek higher ground, if you can do so safely. • Stay informed about the storm and possible flooding by listening to your NOAA weather radio, commercial radio or television.